The server has four Gigabit Ethernet network connectors, marked NET0, NET1, NET2, and NET3. Use these ports to connect the server to the network. 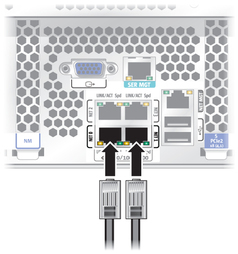 Note - The Oracle ILOM sideband management feature enables you to access the SP using one of these Ethernet ports. Refer to the SPARC T4 Series Servers Administration Guide for instructions.